Photo Credit: Red Bull Records. Fla.—New Beat Fund will be touring parts of Fla., from July 3 through July 6. They will be performing a Vinoy Park in St. Petersburg on July, Cruzan Amphitheatre in West Palm Beach on July 4, Tinker Field in Orlando on July 5 and Morocco Shrine Auditorium and Grounds in Jacksonville on July 6. The tour will begin on May 1 at Lido Live in Newport Beach, Calif. and they will be on the same bill as Nikka Costa. It will conclude on Aug. 8 at White River Amphitheater in Auburn, Wash.
“Sponge Fingers” is New Beat Fund’s debut full length album and it will be released on June 16. They will be on tour promoting the album which was mixed by Tony Hoffer (Foster The People, Beck), co-produced by Matt Wallace (Faith No More, Maroon 5) and was recorded at Sound City Studios. 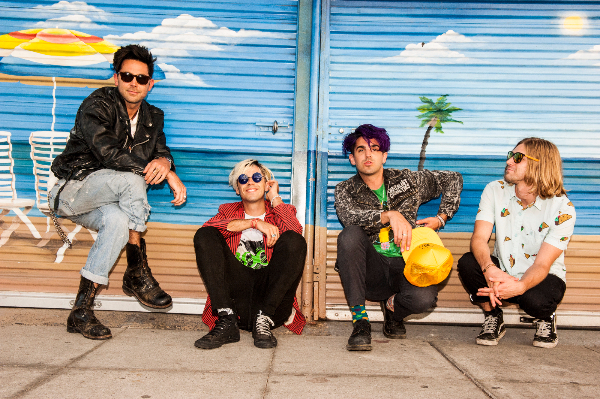 A mixture of surf rock, hip-hop, garage pop and west-coast punk called “G-Punk” can be described to call their upcoming record. Shelby “Button” Archer is the guitarist, Michael “Silky” Johnson is the drummer, Jeff “Burnie Baker” Laliberte is the guitarist and vocalist, Paul “Snapz” Laliberte and is the bassist of New Beat Fund. The name of the band was inspired by a piggy bank with the words “New Beat Fund” encoded on it and it was hurled at the frontage of a corporate building. After forming a number of years ago—New Beat Fund released their EP, “Coinz”. “Scare Me” from the EP has been on heavy rotation on SiriusXM’s Alt Nation. It will also be on their upcoming album, “Sponge Fingerz”. Other songs on the album include “Sikka Taking the Hard Way”, “Halloween Birthdaze”, “It’s Cool” and “Sunday Funday”. Kat Corbett, disc jockey for 106.7 KROQ, premiered “It’s Cool” on her radio program and MTVU premiered the video for “Sunday Funday” and can be heard on select radio stations in San Francisco, Seattle, Portland and Boston. This tour, New Beat Fund will be sharing stages with Nikka Costa and Shwayze. In the past—they’ve shared stages with blink-182, 3OH!3, Aer and Pepper. The world is their stage, as they have performed venues throughout the west coast and local frat parties. June 19 - Pomona Fairplex, Pomona, Calif.
June 20 - Shoreline Amphitheatre, Mountain View, Calif.
June 21 - Seaside Park, Ventura, Calif.
June 23 - Quail Run Park, Mesa, Ariz.
June 24 - Isleta Amphitheater, Albuquerque, N.M.
July 1 - Tennessee State Fairgrounds, Nashville, Tenn.
July 3 - Vinoy Park, St. Petersburg, Fla.
July 4 - Cruzan Amphitheatre, West Palm Beach, Fla.
July 5 - Tinker Field, Orlando, Fla.
July 6 - Morocco Shrine Auditorium and Grounds, Jacksonville, Fla.
July 7 - PNC Music Pavilion, Charlotte, N.C.
July 8 - Farm Bureau Live, Virginia Beach, Va.
July 11 - Nikon at Jones Beach Amphitheatre, Wantagh, N.Y.
July 12 , Xfinity Theatre, Hartford, Conn.
July 14 - Xfinity Theatre, Mansfield, Mass. July 15 - Darien Lake PAC, Darien Center, N.Y.
July 18 - Merriweather Post Pavilion, Columbia, Md. July 19 - PNC Bank Arts Center, Holmdel, N.J.
July 21 - The Pavilion at Montage Mountain, Scranton, Pa.
July 26 - Canterbury Park, Shakopee, Minn.
July 27 - Hollywood Casino Amphitheatre, Maryland Heights, Mo. July 29 - Klipsch Music Center, Noblesville, Ind. July 30 - Cricket Wireless Amphitheater, Bonner Springs, Kan.
Aug. 7 - Portland Expo Center, Portland, Ore.